In fourth grade, my friend Trish Zornio dressed up as the State of New Hampshire for Halloween, which she fashioned out of a piece of cardboard she procured from a local appliance store, color coding all the counties in crayon, with a hole cut out for her face in the county where we lived; she painted a red dot on her nose for our hometown. Trish was the first friend I made by myself. We met on our first day of preschool in a small, rural town, situated in a picturesque valley, flanked by mountains and a river that wound its way from the neighboring mill town. On winter days, we knew it was going to snow when southwesterly winds carried the smell of smoke from the paper mill where her dad worked. We played together, had sleepovers, and partnered in gym class. I remember her childhood phone number. I remember talking about how our grandparents, all immigrants, learned English after they arrived in America. I remember telling our elementary school music teacher we both wanted to learn to play the flute. I remember the day she told me her parents were getting divorced. I remember writing in each other’s senior yearbooks. We went to public school together all the way through high school. In those intervening years, our community was hit hard by the closure of the pulp and paper mills, caught in the midst of economic strife and budget cuts, leaning precariously on what would become the opioid epidemic. Our world as students changed with the shooting at Columbine High School and, a few years later, 9/11. We saw industries lost and wars begin and families fall apart. We saw classmates drop out of school. We saw hardship. Trish lived hardship. But she endured. She persevered and she saw possibility. She saw hope. We found many moments of joy and laughter, and, somewhere along the way, we grew up. 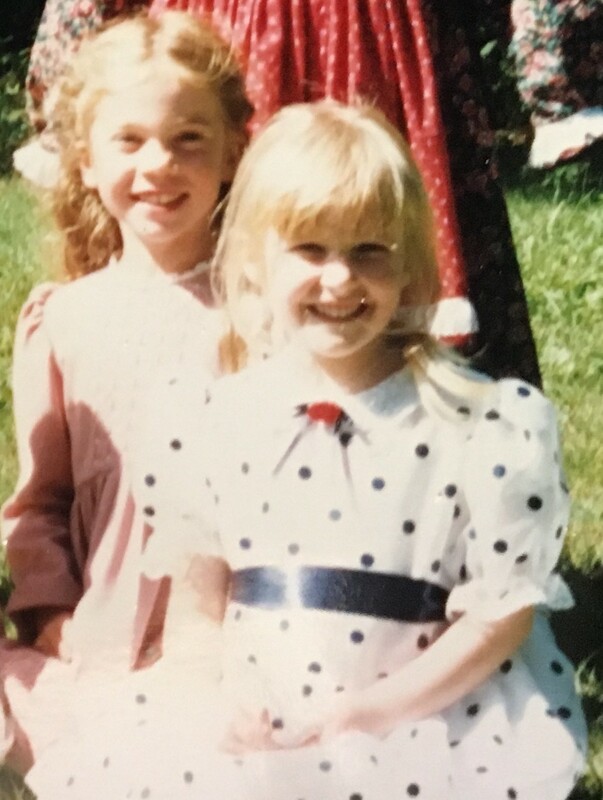 Tasha (left) and Trish (right) at a birthday party circa 1992. Trish went on to college and then to graduate school. She became a scientist. She worked hard. She saw a need to work harder. Now I am proud to say she is running for U.S. Senate in Colorado. Growing up, Trish and I didn’t know that the river we found so beautiful, the one that flooded the parking lot of our high school on spring days when the snow melted and the rain came hard, was part of the impetus for the Clean Air Act and cited as one of the most polluted rivers in America. No one told us. We didn’t know that our country would one day be run by people who deny the reality of climate change, ignore science, and be content to destroy our planet, our home, in favor of money. No one prepared us. But we know now. We learned. And now Trish is taking action. Colorado was admitted into the Union in 1876. In the span of the last 143 years, no woman has ever been elected to serve as a senator. In 2019, there are no scientists on the U.S. Senate Science Committee. Trish is running for senate to change the status quo. I know how deeply she cares about bettering the world, from making sure there is equity and opportunity in the workplace for all Americans, to making sure immigrants, like our grandparents, can find safety and opportunity in this country. She knows firsthand how rural and urban communities need sustainable employment opportunities. I know that she will fight for our future: a future where healthcare is a human right, where the pay gap is closed for women and people of color, where students can pursue higher education without the fear of crippling debt, and where America leads the way in environmental sustainability. I know Trish. I know her story and I see her future, our future. She believes in a more just world and she is willing to fight for it. I have watched her fight many battles over the course of her life and she has won, time and time again, with hard work, grit, and determination. For this battle, she needs our help. I urge you to support her campaign for our country and for our future. Teacher. Traveler. Reader. Poet. Aspiring cook.